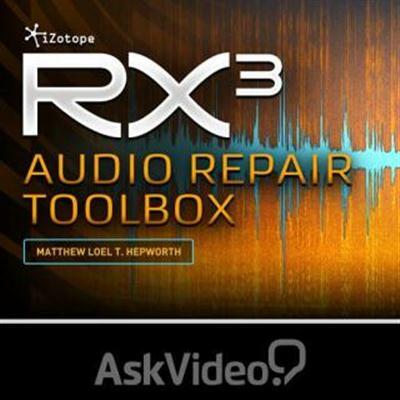 Ask Video iZotope RX 3 Audio Repair Toolbox TUTORiAL-DYNAMiCS | Free eBooks Download - EBOOKEE! Posted on 2013-12-26, by nobihai. Ask Video iZotope RX 3 Audio Repair Toolbox TUTORiAL | 527.48 MB This 43-video in-depth course, by audio expert Matt Hepworth, offers a comprehensive look at iZotope? s RX 3? s arsenal of audio restoration modules. You learn about their functionality and ? with an abundance of real-world audio examples ? you get to see these modules in action. There is no better way to learn about audio and the RX 3! Audio restoration is the holy grail of the music, film, TV and online production industries. Often, good ? ?takes? ? are marred by noise, hum, pops, clicks and other disruptive audio issues. That? s why iZotope has spent countless resources on developing their new RX 3 Audio Repair technologies. This 43-video course, broken down into 12 different (and easily searchable) sections, takes a deep look at all of the RX 3? s repair modules. It contains expert explanations and demonstrations of how each of these modules functions. Every RX 3 module is overviewed, its controls outlined and then put to work on a messed-up audio file while, all along the way, giving you expert advice on how to mitigate each audio example? s issues. So if you? re looking to learn a lot about audio, audio restoration, audio forensics, the physics of sound and the amazing RX 3, you'll find a ton of knowledge right here in this comprehensive course explaining iZotope? s incredible new audio repair software: the RX 3. No comments for "Ask Video iZotope RX 3 Audio Repair Toolbox TUTORiAL-DYNAMiCS".